New Super Mario Bros. 2, the third installment in the New Super Mario Bros. series, is the most original and the most creative game on the Nintendo 3DS, made with never-before-seen assets. Besides saving the princess, a secondary goal of the game is to collect a million coins, for which you pretty much get diddly squat. According to an interview with the game's directors, the development staff for this one consisted mainly of people who had never worked on a 2D Mario platformer before. It... it really shows. 9.2 Thank You For Playing! All of the English text differences between the European and North American versions. All of the unused settings and features that didn't make an appearance in the final. 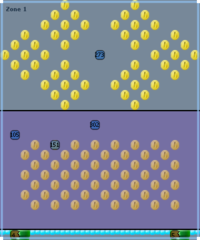 Temporary coins found in every "jyotyu" tileset. ft_MoonCoinGet_00.bclim in MapSceneTop.arc is this image of a Moon Coin with the word "moon" on top of it. Various layout archives contain images of this placeholder Mii. There is also a small variation. There is an icon for a fourth built-in course pack, alongside the used icons. It depicts the Super Leaf. As evident by some of the unused levels, early on the game used a completely different actor assignment table. For instance, the Goal Flagpole object number is 6 in the early table but 97 in the final one. ActorBlockRouletteSwitch (ID 0xB8) is a block that cycles through two colors, red and blue. When hit, it activate a flags that depends on the current color and stops changing color. 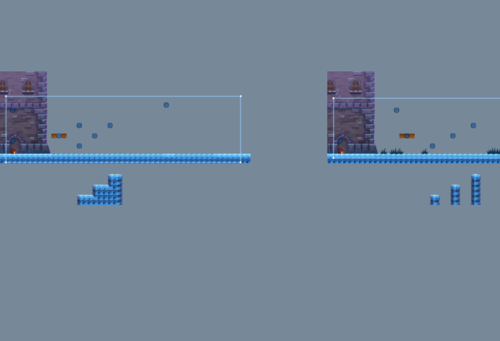 For graphics, it uses two unused tiles from the main tileset. It seems pretty unfinished due to the lack of extra sounds (like the item roulette block and the switches have) and the fact that the tiles aren't displayed with the proper transparency for some reason. Previous games in the New Super Mario Bros. series featured a random flag controller (flags being the things activated by switches). New Super Mario Bros. 2 follows suit, having a FlagSwitchRandom actor (ID 0x19). Only difference being, the actor is not assigned to an object number, and thus unused. However, once restored, it is shown that it has 5 known settings. It has 4 triggering IDs, which the sprite then randomly chooses 1 and activates it. The other event is a target ID, which activates the actor. The "Pipe Bone Piranha Plant - Up" actor is fully functional, but unused. This has an actor associated with it (ID 0xC4) and it makes enemies track the player characters. The actor is incomplete, as the animation for it turning around towards the player looks weird. Judging by the name, it was likely intended for the Bullet Bills (Killer is the Japanese name for the Bullet Bills). This is a version of the Chain Chomp without the pole and uses a different class. It also has a setting at bit 32. Its actor ID is 0x13B. This actor is similar to the version found in the previous game, although there it was a setting of the existing actor, rather than a new one entirely. Similarly to the early object number table, old levels seem to have been designed with old versions of the J_Kihon/Yougan/Chika tilesets, which means those were reshuffled at some point of the development. Trampolines become squished down if Mega Mario walks on them. The posts of Chain Chomps get knocked off-screen like pipes if Mega Mario walks into them. They get pushed all the way into the ground if Mega Mario stands on them. 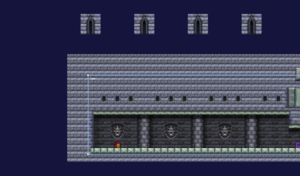 This little stage occupies 45 level slots, and was presumably a placeholder for the slots that were later filled out with actual levels. Uses the early J_Kihon tileset and the early object table. 07-05.sarc contains an ice stage, parts of which seem to have been transferred to World 4-Tower. Uses the early J_Chika and the early object table. A rather unremarkable entrance area with a nice coin slide. Another rather unremarkable area, with some Goombas and a flagpole. 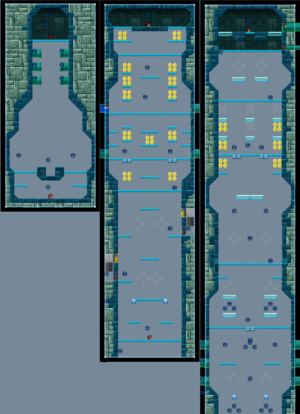 Area 2 of this level was split into chunks, retiled with the Ice Tower tileset and incorporated into 4-Tower. The early level has Koopa Troopas instead of Buzzy Beetles, is generally shorter, and doesn't have any bonus areas. 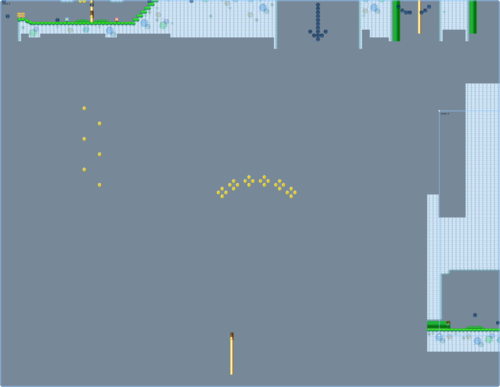 08-04.sarc is an underwater stage which doesn't seem to resemble any other stage in the game. It seems that a small section may have been incorporated into World Mushroom-2, but otherwise is almost completely different. As usual, it has the old object set and the early blocks tileset. The entire area is nothing more but a small beach entrance room with a pipe and the placeholder level used as the flagpole room. This level's only real distinction is that it's the only early full stage that's not an early copy of something else. It's hard to guess what the level would be about, as there's nothing to compare it to. Present in 01-12.sarc. 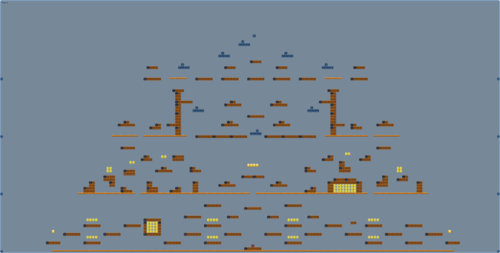 It uses both the early object numbers table and the early J_Yougan tileset. It should also be noted that the -12 slot is generally used for Ghost Houses. 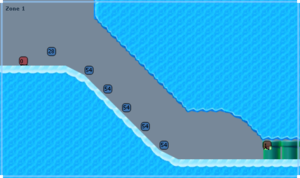 Notable differences in Area 1 include lack of the secret area with the Raccoon Leaf runway and above the final Giant Thwomp. Located outside of the zone in the early layout are also some impossible-to-see tiles and a pipe entrance, which have been removed in the final version. 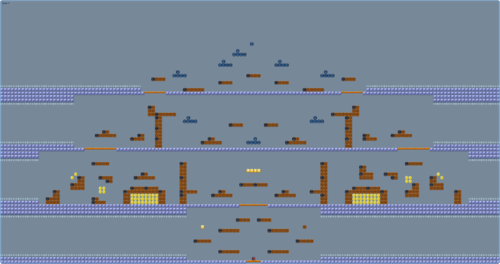 Area 2, not present in the final version of the level, appears to be directly lifted from New Super Mario Bros.' Castle 1 Area 2, bringing an interesting possibility of this level being built using that level as a base. An unpolished version of the final one. 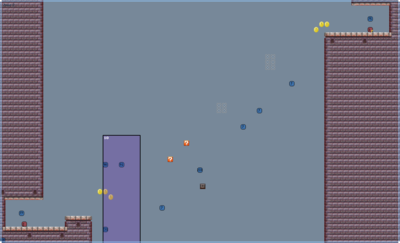 There's no BossShutter objects present, suggesting the bosses worked somewhat differently. The little room where you're supposed to see the next Koopaling run off with Princess Peach is also absent. It should be mentioned that the final Area 3 features some decorative tiles off-zone. Present in 05-09.sarc, complete with the old J_Hikon and the early sprite set as usual. This level seemingly used a different mechanic in its first form, seeing how there are no mushroom stems in the early version. There are no bonus areas, as well. The Sweden-flag-like platforms were removed in favor of more presentable mushroom blocks. 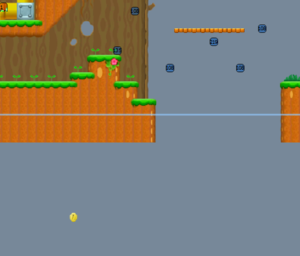 Area 2 of the early version consists solely of a copy of the placeholder level. Present in 06-10.sarc. The only portions present are the section that leads to the final battle with Bowser, and the room where said fight takes place. Area 1 is an early version of Area 3 in the final level. Clearly just temporary work, which was later refined. Area 2 is what's supposed to be the final battle room. It's not clear what the early area was trying to achieve, but what is clear is that the final boss battle was meant to be quite different from how it ended up. Present in 09-10.sarc is a second early iteration of the final castle, although this time all of the areas from the final one are present. The early version of this area is much smaller and shorter compared to its finished version. An entire vertical section has been added, as well as a split path in the middle. Layer 2 backdrop was also included for decoration. This area had a secret Raccoon Leaf alcove added and a line-following flamethrower. Other than that and some minor adjustments to coins, blocks, and decoration, it stayed pretty much the same. This area was made much longer and more difficult. The early version seemingly does not have the stone-turning Koopalings gimmick in it. Once again, an unpolished temporary version of this room. This time, however, there's a little room intended for a cutscene. 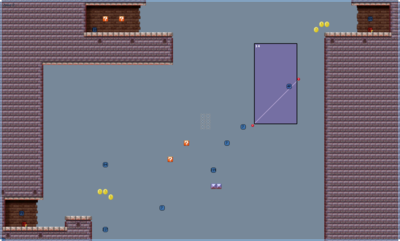 The hiding pits are longer compared to the other early version of this level, and objects have been moved around. A second version of the weird boss fight room, this time without the blue metal blocks or the spikes. The layout of the lowest "level" was altered to be the longest instead of the shortest. Present in 07-04.sarc, with the early J_Kihon tileset and object table. The biggest change here is the mass of coins that was added. 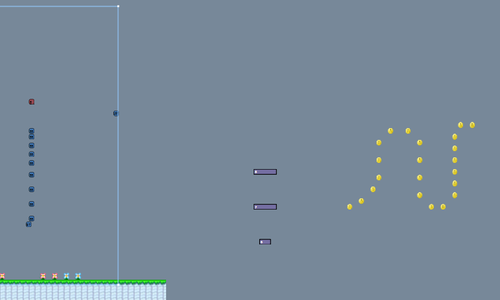 Other than that, the level seems to be pretty much the same with a few cosmetic changes here and there. The early version seems to have nothing of interest except the Moon Coin. The final placed a ton of coins around. This game features more unused stage-related content than the previous iterations combined! World 1-Castle has 4 sets of tiles above its boss zone. 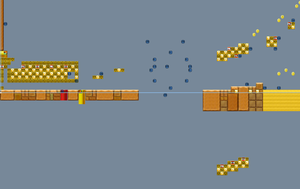 World 2-3 has a block arrangement below the zone which ended up being unused. Flower-Ghost House has invisible tiles to the left of the first zone. 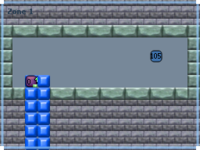 These numbers directly correspond to flags being activated as the player approaches that section of the level. World 3-3 has a whole single unused coin underneath the zone. World Flower-3 has a few unused coin formations and mushroom stems underneath the first zone. Mushroom-Ghost House has some unused staircases located under both of the zones. 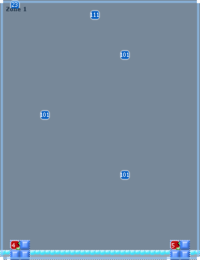 Present in 07-08.sarc are unused tiles off the map and an early version of itself. Some sort of block structure is located underneath Zone 1. 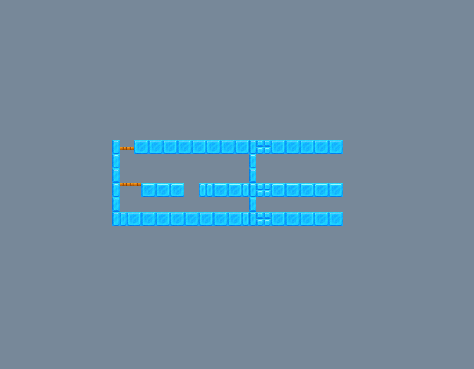 Pointlessly, Area 3 is an early version of Area 1, without Layer 2 tiles and with minor adjustments. It does not use the early sprite sets/tilesets, however. World Mushroom-Castle has a really weird pseudo-level-structure in its boss area. It's pretty much unlike anything else in the game and serves completely no purpose. World 6-2 has empty red switch blocks above both zones. They serve no purpose and cannot be seen. World 5-2 has some flag areas and coins beyond the flagpole, to the right of the zone. They cannot be seen or reached. \Message\[language]\MarioSelect\MarioSelect_00\MarioSelect_00.msbt contains strings for an early file select screen. MarioSelect.bclyt appears to be the associated layout file. T_ThankText_00 Thank You For Playing! E3ThankYouForPlayingTop_00 in \Message\[language]\E3ThankYouForPlayingTop\E3ThankYouForPlayingTop_00.msbt contains this string. A similar string ("Thank you for playing!") can be seen in the pre-release demo(s) and in the post-release EU kiosk demo. This file is only fully present in the EU versions' Dutch text, and it is partially or fully removed in other version/language combinations. The Message Binary Project files (called BigRed.msbp) references a removed file "E3CourseInTop_00". This file likely contained the "Course #" text that could be seen at the beginning of levels in the pre-release demo(s). The Korean version contains the text files from the Europe demo version, partially translated. They aren't used, and the related layout files are not present. 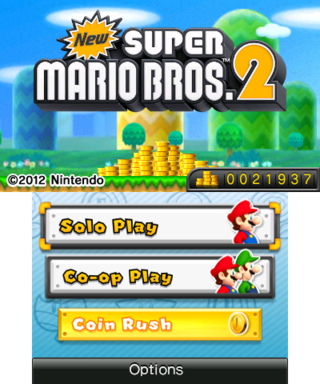 In North America and Europe, a special version of New Super Mario Bros. 2 was preinstalled for a limited time on select 3DS XL and 2DS systems. It was not made available for sale separately on the Nintendo eShop or as a physical cartridge. As a result of including all of the released DLC, the "Shop" option in Coin Rush has been removed. It is possible to re-enable the "Shop" selection by using a save from the game's original release. While the "Shop" selection is visible by doing this, it has no functionality. The project's internal name is "BigRed", according to the exheader title and other data. This may also be reflected in the game's two-letter code "BE" (BigRed). This page was last modified on 12 January 2019, at 17:27.